1A-5A Players of the Week: Week 2! September 17, 2015	Comments Off on 1A-5A Players of the Week: Week 2! Week 2 games were played September 10th-12th. We announce are winners live on our show every Tuesday night. Depending on the area, our show may not hit your town/city till later in the week At the bottom of this post, you can see the listings for when and where the show comes on every week. Offensive and Defensive Players of the Week, Rob Ryan (New Orleans Saints DC) Interview, College Picks, ULM Recruiting Coordinator Mario Price, and Christian Life HC Ben Plamer all highlight this week's show. The full lineup and listings can be viewed in this post. Make sure you do not miss LAFM TV! LAFM TV 10th Season Starts Today! September 8, 2015	Comments Off on LAFM TV 10th Season Starts Today! Looking at this weeks show, Ronnie Estay (Canadian Football Hall of Fame, Former Edmonton Eskimo and LSU Tiger) is our guest. Ronnie will share stories from his past and talk with Lee about this year's LSU Team. Starting this season, Lee Brecheen will be doing college and high school game picks with assistant Reid Althage. We will be continuing our 1A-5A Players of the Week. We will also have a recruit video from one of the top QBs in North LA. Tune in tonight to LAFM TV! 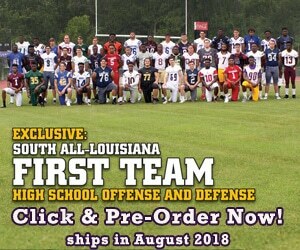 Hey everybody, the new 2015 Louisiana Football Preview Magazine is now out in stores. We have locations all over the state. If you are looking for a place to go buy the magazine, check out this link where we have all of our stores listed. August 3, 2015	Comments Off on 20 Questions with DL/OL Chris Spence, Jonesboro-Hodge High School. OG/DT Chris Spencer made All-District in 2014. For a kid over 300 lbs, this kid can really run. Spencer is Jonesboro-Hodge's anchor on the Offensive and Defensive line. He is starting to get interest in some top D1 programs in and outside the state. We are really excited to see what this kid does in 2015. Meet Chris Spencer in today's article! Johnny Hector played RB for New Iberia High School, Texas A&M, and NY Jets. Johnny is one of the greatest RBs/players to ever come out of Louisiana. Kerry Joseph played QB at McNeese from 1994-1997. He went on to play for the NFL Europe, the Seattle Seahawks, and the CFL. He won the Grey Cup in 2007. Check out our TV show with both of them in today's Show! Haynesville High School has become a powerhouse in 1A Football. It all started with Alton "Red" Franklin. The Louisiana Sports Hall Fame member is one of the greatest coaches Louisiana Football has ever seen. Now his son, David Franklin, has taken over the reigns. Read about the Franklins and the Tornados in todays Story!